Beautifully engraved certificate from the Wagner Palace Car Company issued from 1890 - 1893. 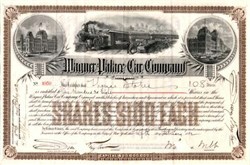 This historic document was printed by the American Banknote Company and has an ornate border around it with three vignettes of 1.-Upper left, is of the original Union Station in Chicago that burned in the Chicago fire. 2.-Upper right, is the original Grand Central Terminal in New York City. 3. -Center is a passenger train, with sleeping cars, probably leaving New York for Chicago as Grand Central Terminal is in background along with the Brooklyn Bridge. This item is hand signed by the Company�s President (W. S. Webb) and its Secretary ( James. D. Taylor ) and is over 110 years old. Diamond Cut cancelled. This company was controlled by the New York Central RR and in competition with the Pullman Co. for sleeping car patrons. W. S. Webb, was the son-in-law of William H. Vanderbilt. Wagner became a part of the Pullman Company on Jan 1,1900.